Telepractice is an effective and affordable alternative to traditional speech therapy. With Lingraphica's TalkPath Live our certified speech-language pathologists (SLPs) use a computer, a webcam, and video software to conduct remote speech therapy sessions with clients. However, for clients with speech, language, or cognitive difficulties, connecting to a computer can be a challenge. 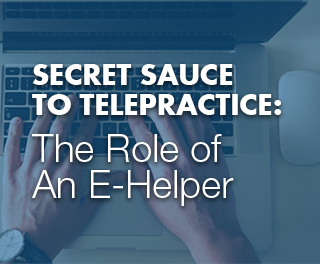 In our experience with TalkPath Live we discovered the secret to successful therapy is involving an “e-helper.” In this blog, we’ll show you how our own experience has pointed to the effectiveness of an onsite e-helper. We define an e-helper as someone who is able to turn on the computer and go to the TalkPath Live website. Knowledge of basic computer vocabulary such as, monitor, mouse, keyboard, and click is needed. An e-helper may also need to be able to follow instructions from our Care Coordinator to complete a tech check (a check we conduct to make sure the client's computer will work for telepractice). Often times, the e-helper role falls on a caregiver, child, grandchild, or neighbor. Most importantly, an e-helper and an active and continuous onsite support person who is available during sessions. Their role: A clearly defined role helps e-helpers understand when and where to get involved. For example, if they do not understand their role, they may infringe on the therapy and complete tasks that are intended to be therapeutic in nature. We establish this role upfront before telepractice begins. Draw the boundaries: By establishing boundaries, the e-helper knows when it’s appropriate to act on behalf of the client; this includes speaking, answering or communicating for the client. Reduce frustration for the client: We teach the e-helper techniques to minimize frustration for the client — such as cueing up technology for the therapy session and assisting with software and hardware issues — so the client remains focused on meeting therapy goals. Work towards goals together: The e-helper often works with our team to ensure the client’s established therapy goals are met. By reviewing the goals with the e-helper ahead of time, a client will continue to make gains in their speech. Research shows that teletherapy is as effective as traditional therapy. This assumes, however, that the teletherapy sessions are seamless and technologically glitch-free experiences for the client and SLP. Our team does everything from a technology standpoint to make sure the sessions run smoothly, but the true secret to success is an e-helper who is committed to ensuring telepractice is continually effective for the patient. If you think you’d be a good fit as an e-helper for your loved one suffering from a speech or language impairment, call our team. We can train you and start speech therapy with your loved one soon.